Cristiano Ronaldo doubled Juventus’ lead against Sassuolo in the 70th minute of the Serie A clash with a thunderous header from a corner. Playmaker Miralem Pjanic delivered a inch-perfect corner into the box that was crying out for someone to come and attack the ball. 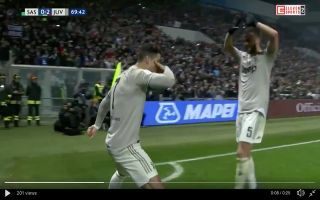 The ball evaded the head of Martin Caceres, but Ronaldo was on hand to beat Sassuolo’s goalkeeper to the ball and head into the back of the net. Juventus will be 11 points clear at the top if they can hold on to a win today, the ‘Old Lady’ have dominated Serie A in recent years, but the signing of Ronaldo will give fans a new-found level of excitement heading into the knockout stages of the Champions League. Juventus have been so close to the trophy in the last couple of years.